Powers/Abilities: Josh Guthrie possesses no powers beyond the natural abilities of a boy in his teens. He has displayed some musical talent with a guitar. History: (What If? II#92 (fb)) - After being picked on at school by Paul Hoencheck and being somewhat ignored at his home by his family, Josh Guthrie sought solitude with his guitar by the local river. After breaking a string on the instrument, he angrily threw it in the river, where it hit a large domed object protruding from the water. Investigating, Josh realized it was a giant robot. Messing with a control panel, Josh accidentally reactivated the robot, actually one of the mutant-hunting Sentinels. With it's programming damaged and self-repairing at a very slow rate, the Sentinel managed to imprint Josh's order to protect him. Deciding to use his new find for petty revenge, Guthrie took the Sentinel to the local school to scare the bully Hoencheck. At home, Josh was angered by his mother's constant references to Josh's older siblings, Sam and Paige, otherwise known as Cannonball and Husk. 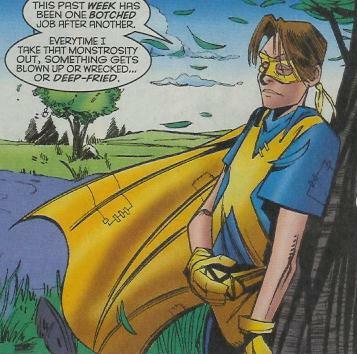 Wanting to prove himself every bit the superhero they were, he painted the Sentinel (which he was keeping hidden in the barn) the blue and yellow colors of the standard X-Men uniform. Adopting a self-made suit himself, Josh and his robot set out about town at night, causing all sorts of accidental destruction. 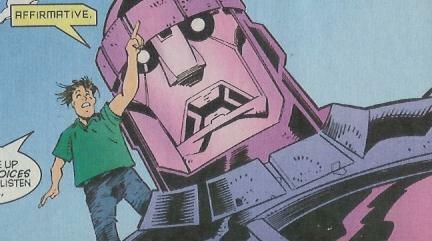 Afterwards, Josh decided to tell his mother, all the while the Sentinel was repairing its true programming. (What If? II#92) - As Josh and his "X-Sentinel" stood outside the Guthrie home, his mother was too busy to come see what he wanted to talk about. Later on, after Sam and Paige arrived, the Sentinel's programming had recovered enough for it to recognize them. It attacked them in the home and severely beat both of them in battle. Before it could deliver a killing blow, Josh stood between his siblings and the Sentinel in an attempt to protect them. 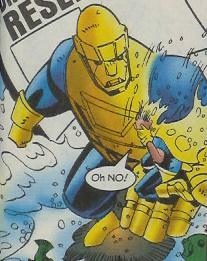 With its two lines of programming (to kill mutants/to protect Josh) in conflict, the Sentinel hesitated. Josh commanded the robot to protect him, and when it couldn't do that and still kill the others, it's programming relinquished to Josh's command, and the Sentinel used its propulsor ray to blow its own head off. Later on, Sam confronted Josh, who was back at the river. He convinced his little brother that a real hero would take responsibility for his actions, and as Josh wondered what would happen when the townsfolk found out he was behind the robot, the two walked off. Comments: Created by Joe Kelly, James Daly and Harry Candelario. Wow, does this story sound a bit familiar or what? For everyone who thought Sean McKeever's book SENTINEL seemed reminiscent of the movie The Iron Giant, take a look at this book. I honestly don't know what makes this particular tale non-616. To the best of my knowledge, Josh of Earth-616 didn't become Icarus until later. I'm using the most common Earth-616 names for several of the family members seen but not named (the mom and twins), but since this is a divergent earth, it's entirely possible they may be named differently. any of his brothers, sisters, fathers, uncles or third cousins, twice removed. A Sentinel that had for some reason been left in the river near the Guthrie's house. It was recovered by Josh Guthrie, who painted it blue and yellow to resemble the X-Men uniforms, and used in Guthrie's disastrous attempt to become a super-hero. It destroyed itself when its programming to protect Josh came into conflict with its programming to kill mutants, namely Cannonball and Husk, whom Josh was standing in front of.